Agency Power Fuel Injectors SUBARU - Dezod Motorsports Inc - Home of the automotive performance enthusiast since 2002. With many owners wanting to push the limits of their motor, more fuel delivery is much needed. With several different options available, Agency Power has just released a new option for owners wanting more fuel for their higher horsepower cars at an affordable price. 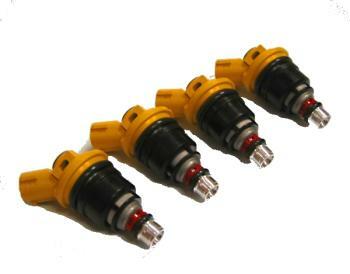 These injectors are designed for cars with large turbo kits making considerable more horsepower. We have these injectors available as brand new sets of 4 or you can also send your original equipment injectors to us at Agency Power for modification for a small fee. Mail-in injector modification receives FREE overnight return shipping. Modification turnaround takes up to 24 hours from the receipt of the injectors.